Convert, edit, cut your videos with these ultimate tools that combines great speed and ultimate quality! Here is a guide for the following there products: ConvertXtoVideo, Blu-ray Converter and DVD Converter. The same guide applies to these 3 products as work the same way. The difference between the 3 is the way the input files are displayed in the main interface. Blu-ray Converter and DVD Converter only support as an input formats Blu-rays and DVDs respectively. For these two programs we use a special advanced parsing method allowing to extract all extra video parts like bonuses, angles, versions, while ConverterXtoVideo extracts and displays only the main parts. *The color of the interface may be different than in the screenshots below depending on the product you are using (option you can change yourself too if desired, see options in guide below). 1. Insert your video(s). Use either one of the buttons to browse for your files. You can also drag and drop them directly into the main window. Almost ALL video formats are accepted, including the most popular: avi, flv, decrypted DVD and Blu-rays, mov, etc, etc. To remove a file, select it and click on "remove selection". In particular for Blu-rays and DVDs make sure the file is decrypted. 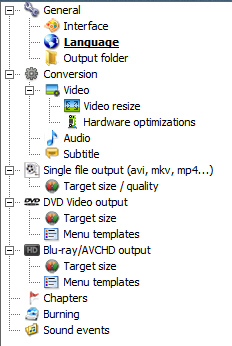 In DVD and Blu-ray Converter, if check boxes are displayed in the main interface, you can click on the nodes next to them to expand each section and see more videos underneath that item. 2. Select the conversion format. You can select only one conversion output for each conversion “session”, ie, if you add 3 videos in the main window, they will all be converted in the same format. If you want some of your videos in other formats, then you have to start a new session after, and each time select the output format of your choice. The formats available: Generic Video (Avi, MkV, Mp4), Smartphones (Iphone and Android), Tablets (Ipad and Android), Portable Devices (Ipods, Mp3 players), Game console (Playstation, Xbox), DVD Video (PAL and NTSC), Web designed, Transport stream, Blu-ray and AVCHD, Audio (this will extract the audio from the video to Ogg, Mp3 or Mp4) and Custom profiles. See our guide on creating custom profiles and why it can be useful. 3. If you don’t want to do any editing on the video, or don’t feel confident to use the advanced features, simply click on “Start”, that’s it! Not sure what format to select? 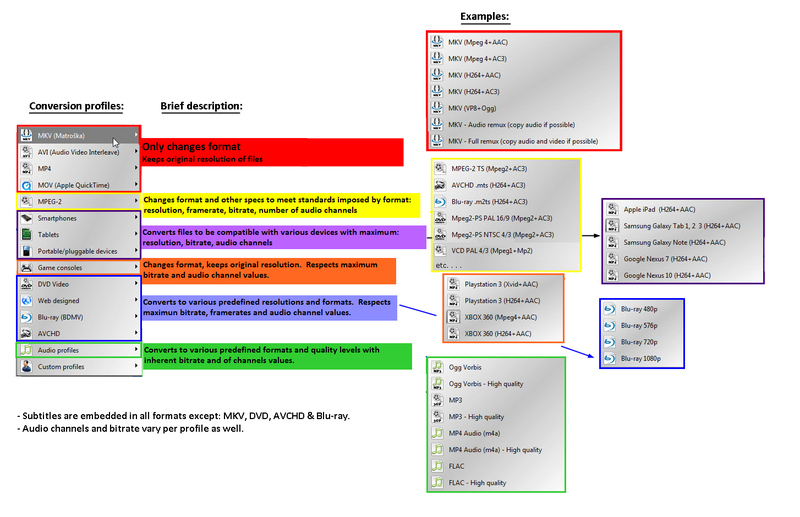 Here is an overview with a brief description of the various formats, see overview. 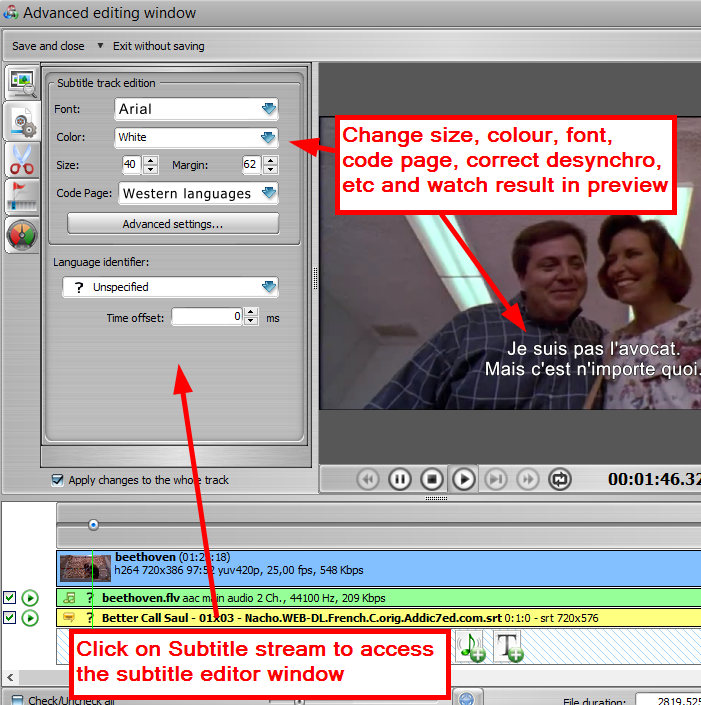 To access the video’s settings and make further editing, click on "Advanced Edit": in the window that opens, you will see the options on the left, the preview on the right and video structure at the bottom. 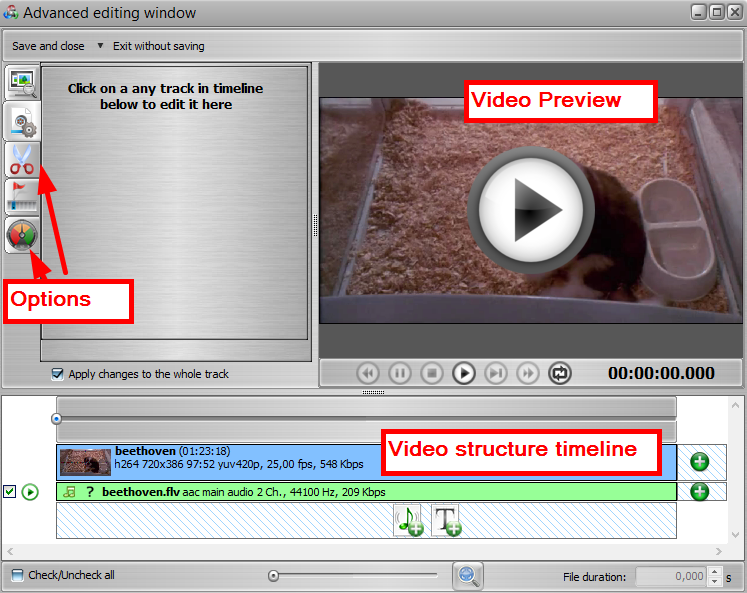 Here is how the timeline is built: All tracks on the video are shown here. If you want to add any other files, whether audio or subtitles, you have to do it here. If you click on the “add file “symbol on the right of the existing video track, this will merge the files together, creating only one file after conversion. To edit a particular track, click on it and a cursor with a green vertical line shows the playback progression of the preview. 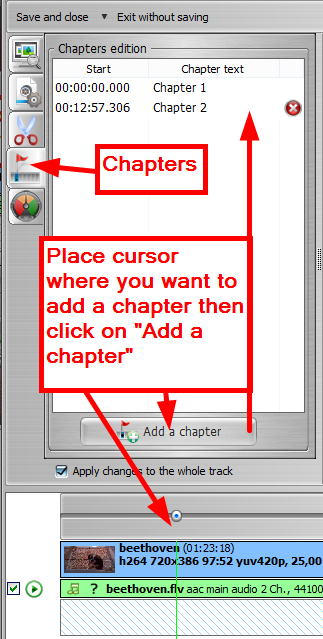 You can scroll the cursor with the mouse to go backward or forward in the preview above, or to position a cut or chapter section. Watch out for the arrow symbol on the left of each track. The first one indicates that the track is selected to be added to conversion. The second one means the track is selected to be played in the preview. File Explorer Here you can browse files and drag and drop them into the timeline below in case you want to add other videos, audio or subtitle files. The second tab is the conversion advisor (available for all outputs except DVD) this will give a good idea of the overall quality/output file size. The third Tab is for Brightness and contrast. Here you can use the controls to change the brightness, contrast and gamma correction levels on the video. Results are shown live in the preview. You can cut off any unwanted parts of the video, and make as many “cuts” as necessary within the video. Simply place the cursor in the underneath timeline where you want to start the cut and click on “Start Cut”. 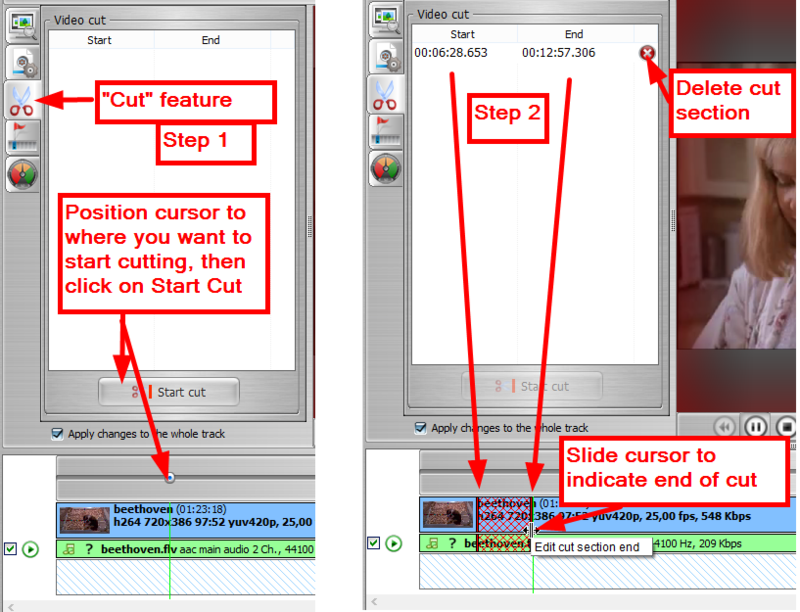 Then drag the cursor until the position where you want to place the end of the cut, and click on “end Cut”. This will create an entry with the timing of the beginning and end of cuts. You can create as many “cuts” as you want that way, each will appear in a chronological order in this window. Each “Cut” selection is also shown in the timeline below as a red portion so it is clearly identified that this part will be removed in the conversion. If you want to cancel a cut selection, simply click on the red X on its right. 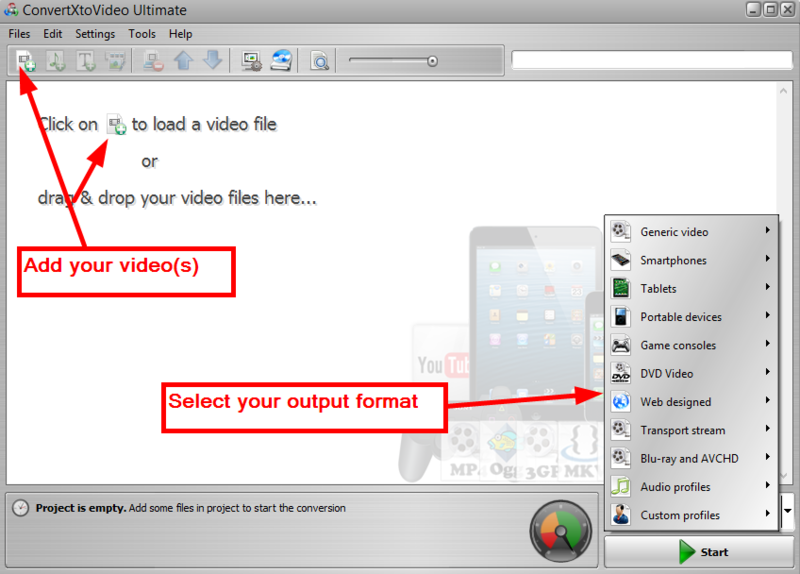 Chapters: With DVD, MP4 and MKV outputs, you can add chapters to the video. Add subtitles: to add subtitles, you can drag and drop them from the explorer (first tab, see above) or click on the T icon at the bottom, and select your file. You will see a new track be added to the timeline. Click on this track to edit your subtitles, in the Track editor above. If the subtitles are in .srt format, you will be able to change the font, color, size, code page of the text, as well as add a positive or negative offset to correct desynchronization if needed. Any editing is shown live in the preview. 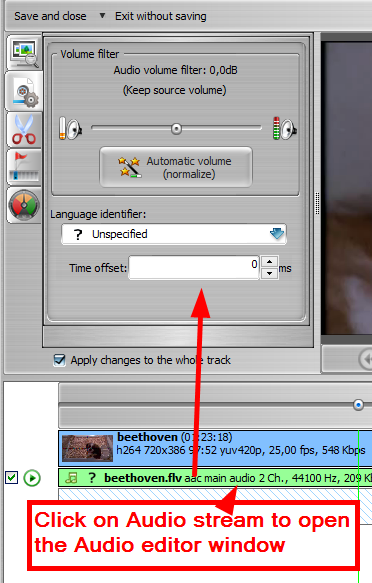 Add Audio: Same as for the subtitles, click on the audio track to access edition options in the Track Editor Tab above. There you will be able to increase the sound volume. With the new "Automatic volume" button, the volume will be automatically calculated and set to be constant and at a "normal" volume throughout the video. This is a great option for videos that have volume variations or very low volume. You can also add an offset to correct any audio desynchro. Check the result in the video preview. Maximum simultaneous conversion: indicates how many simultaneous conversions can be made, in case you've got more than 1 titleset. The max number of simultaneous conversions you can select is determined by the number of cores in your hardware. Minimum free memory: indicate the minimum of free memory that you want to keep while the converter is working, if you want to do additional tasks on your PC during the conversion. Process priority: If you are doing other tasks at the same time on your computer you can set the priority level in which your computer will treat the conversion in order not to slow down your other tasks or to prioritize the conversion instead. Generally, it is best to run ConvertXtoDVD without any background tasks going on. Use 2 pass encoding: the program encodes the video with a variable bitrate, which is best for quality, using a customized Constant Quality encoding method. This means that if a scene is "complex" (example: with fast movement), the encoder will reserve more space for this part of the video than for simple scenes (static) with less information (elements). The more/longer the video you want to put on a DVD, the lower the average video bitrate must be, so it is more important to save some space during "slow" or static scenes to provide more space for "fast" action or detailed scenes. In the two pass mode, the first pass encodes the video but does not write the video to the disk, analyzing and taking notes of the video file in order to get an overview of the whole video file including specific information about scenes. The second pass has the job of doing the actual encoding. When the second pass starts to encode, it has for each frame the value of the complexity (including other information such as motion vectors, ...) determined during the first pass. So, the encoder is capable of distributing the bitrate exactly where it is required, taking the whole movie as reference. Audio encoding is done in second pass. If unticked/unchecked) then the software will use the Single pass encoding: The encoder doesn't know the complexity of the scenes because they were not yet played. So, averaging the bitrate must be done within a small portion of the video (a few seconds). Thus, it may occur that if a complex scene arrives, but to maintain the average bitrate over the slice of video considered, there is not enough bitrate available to handle the scene, thus giving artifacts. Because ConvertXtoDVD uses a smart encoding process based on the Constant Quality encoding method rare will be the number of 2 pass conversions that will give better quality than simply 1 pass conversions. Resize filter: These filters are written from scratch and are possibly similar to the existing original filters from the respective creators. Search the internet for their intended working and purpose of the filter. Testing at VSO shows that Lanczos gives the best result for majority of conversions. Some filters have longer processing time and maybe better quality than others due to the complexity of the algorithm. You will need to decide which filter works best for your source. Video resize method: Select how videos will be resized to fill / fit the screen by default. Use hardware decoding: Checking this option may give faster results depending on your computer and graphic card (basically if you see less than 30FPS for the encoding of titlesets then try checking this option to get faster conversion times). For a complete description of this setting please read this post. Note: the simultaneous conversion setting will be is disabled when hardware decoding option is enabled. Audio: you can increase the file volume if it's too low. Target size/ quality: here you can play around with the size vs quality setting. By default this setting is set at 50% but you can increase it if you want a higher quality, or decrease it for a lower quality/faster conversion result. DVD Video output shows options for DVD output only. Burn result to DVD: select "burn DVD video projects after conversion" if you want the burning process to start automatically after conversion. Target Size: indicate if you intend to burn on a "normal" DVD (also called DVD 5, or if you have a "big" project, you will have to burn on a Double Layer DVD (DVD9). You can also enter a custom value. Menu Template: select the menu of your choice from a list of 12 templates. General Settings: enter the preferred options for the behavior of the video and menu when playing the DVD on a player. Blu-ray/AVCHD output shows options for Blur-ay or HD structures output only. Select "burn Blu-ray/ AVCHD projects after conversion" if you want the burning process to start automatically after conversion. Target Size: indicate if you intend to burn on a BD-25 or BD-50 disk. You can also enter a custom value. General Settings: enter the preferred options for the behavior of the video and menu when playing the disk on a player. Sound Events: Tick or untick "Play sound events" to turn on/off the vocal indications guiding you through the software: warning in case of problem, telling you when the conversion is over, etc. If you want to disable one or more of the sounds, click on the music note icon with the red X next to the file. Process Completed: Is played whenever an operation has been finished (i.e. conversion or burning process is done). Question: Is played when the application needs you to make a selection in order to continue. Writable DVD Required: Is played when you need to insert a media to burn. Problem Detected: Is played when an error or other problem has occurred. Update Available: Is played when a newer version is found online. Customize the Sound events: You can customize the played events by adding other audio files. To change the default file and add your own, simply click on the folder with the music note icon, browse for your file and. Click on the green play icon to check your selection. For a fun use of this feature, we have packaged a few sounds from various known characters (cartons, movies, etc). They can be downloaded from our forum. Action after conversion/burning: select the action to be performed once the software has completed the conversion/and/or burning: do nothing, shutdown PC, hibernate PC, close program. Burn already converted projects: if you want to burn a conversion done earlier, or make additional copies of a disk, you have the three choices depending on the output format of the previous conversion: DVD/Blu-ray/AVCHD, ISO or other formats. Report a problem: if you run into any problem, or have a question to ask about the software, click here to open the support form. You will have to fill it in and send it. Check for update: the VSO updater will tell you if a new version is available or not. We advise to always upgrade to new versions whenever possible. Click on "Help" on the top hand side, and click on "Enter registration key"
You will find ConvertXtoVideo is the Best video Converter for converting, mkv to blu-ray, avi to mp4, mp4 converter, avi to blu-ray, flv to avi, mkv to avi.